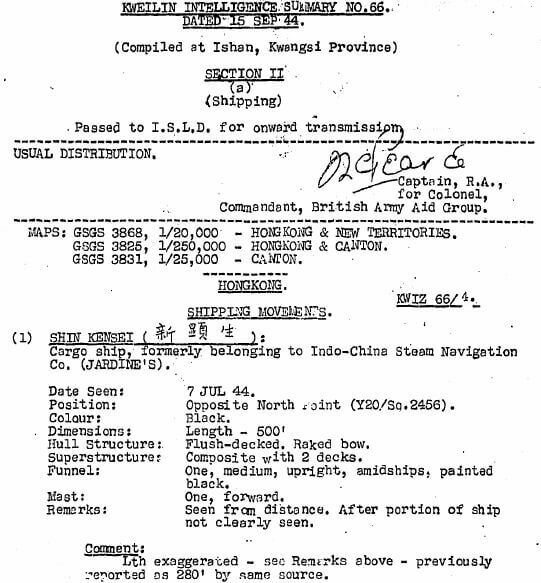 Elizabeth Ride has British Army Aid Group (BAAG) records of shipping movements for 1944-45 in Hong Kong during the Japanese occupation in World War Two. These provide information not only about the ships themselves but what cargo was being brought into and out of Hong Kong during the latter stages of WW2, passengers carried, and of godowns, docks etc that were being utilised. 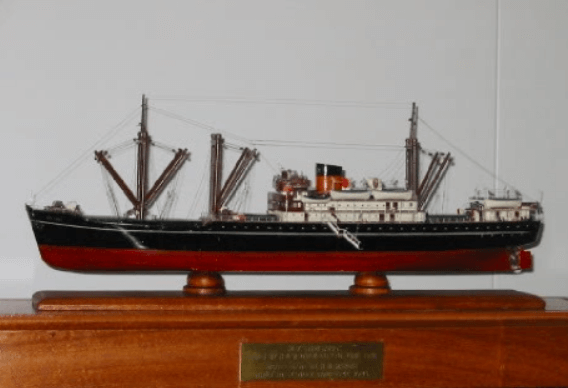 Thanks to Stephen Kentwell for sending this a photo of a model of the Hinsang which is now displayed in the Jardines London office, and was made by Mr. H.N. Hardie while interned in Stanley Camp (Hong Kong) between 1942 and 1945. This article was first posted on 12th March 2017. Built by Hong Kong & Whampoa Dock Co. Ltd, Hong Kong for ICSNC. 20/2/41 delayed launch after loss of steelwork on 11/7/40 with City of Bagdad (7506/20) – on completion in service Hong Kong/Sandakan. 25/12/41 scuttled at Hong Kong. Salvaged by Japanese and 4/43 r. KENSEI MARU. 12/1/45 bombed and sunk by US aircraft 25 m. SE of Phanrang, South Vietnam. Stephen is almost certainly correct in his identification. .Kensei Maru (NB not Shin Kensei Maru) was ex Hin Sang and did call at Hong Kong during the war after completion there apparently. But this specific BAAG report is incorrect. Between 23 June and 14 July 1944 the Kensei Maru was sailing in convoy MOMA-09/MI-09 from Moji (Shimonoseki, Japan) to Manila via Takao (Kaohsiung). While some ships stopped at Kirun (Keelung) no ships sailed to Hong Kong as part of this convoy. The familiarity with Kensei Maru would have meant ships of similar appearance could be mistaken for the ship. The correct identity of this particular ship is unknown.